PAT PILCHER’s quest to improve the wonky Wi-Fi in his wife’s home office finds success. In my case it’s my wife’s office. Her home business needs reliable internet access. Her office is at the opposite end of our house from the router. Making matters worse, there’s also block of flats nearby blasting a zillion different Wi-Fi signals into our place. Running ethernet cables isn’t an option unless I want to rip out wall panels and flooring. The mains networking products I’ve tested so far aren’t fast or reliable enough. What’s a stressed-out geek and his irate wife to do? 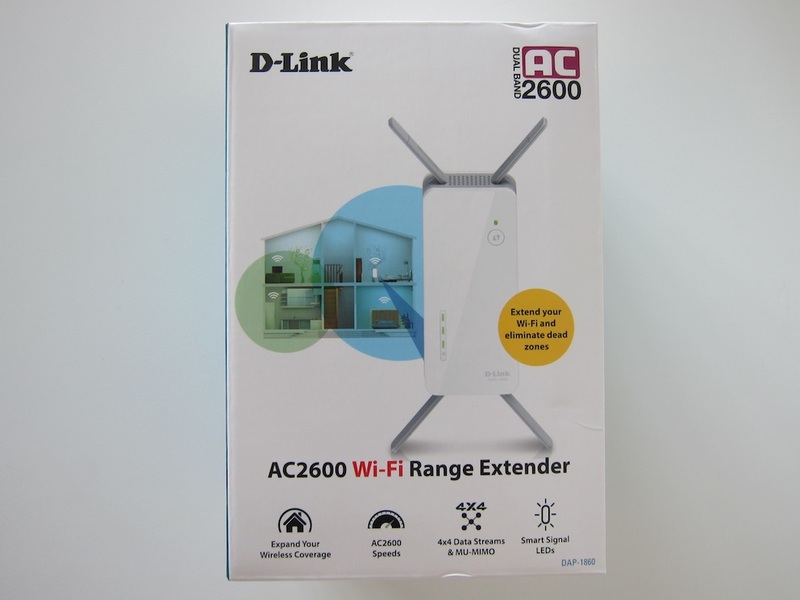 Enter stage left D-Link’s DAP-1860 AC2600 Wi-Fi Range Extender. In theory it should resolve reception woes by filling in the Wi-Fi coverage gaps in my wife’s office. It does this by rebroadcasting the wireless signal from my router. Looks-wise, it’s an odd-looking beast. Imagine the lovechild of a power brick and a spider (its four fold-out antennas give it a distinctly daddy long legs like quality). On its underside is a mains power plug. This makes getting it up and running easy as – just whack it into a mains outlet near the Wi-Fi black spot and hook it up to the router. Getting the location of the range extender right takes a little fiddling about. This consisted of plugging it in and seeing what the signal strength LEDs on its front say (more LEDs lit equals better). 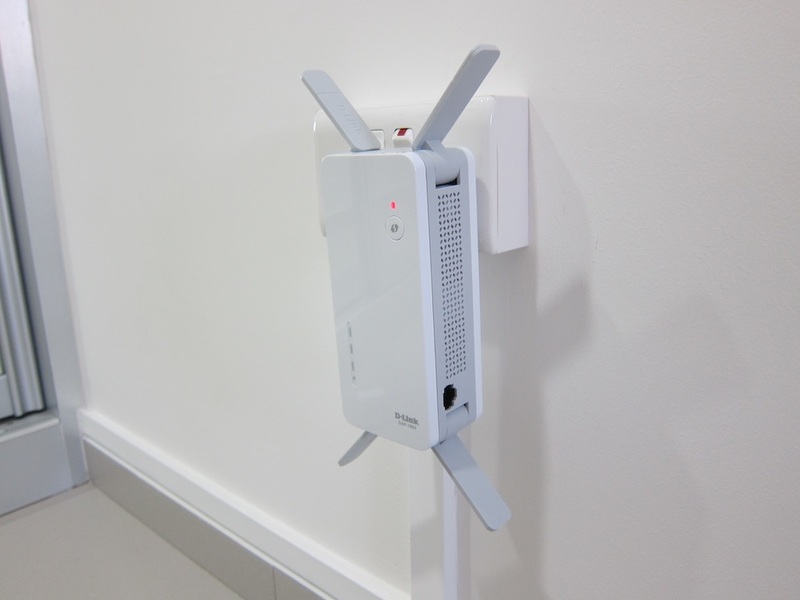 There are three ways to get the range extender hooked up to your router. The simplest is to press the WPS button on the extender, race to your router and hit its WPS button. If running around the house doesn’t float your Wi-Fi extended boat, you can use a smartphone app (iOS/Android), but it’s the least intuitive means of getting set up. This is because you’ve got to connect your phone to the extender’s Wi-Fi. 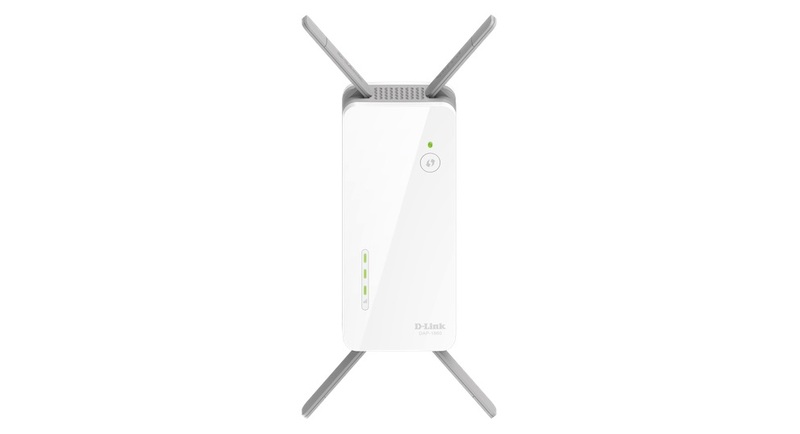 The most flexible method involves connecting to the extender and accessing its settings via a web browser. The DAP-1860 is dual-band, so it plays nice over 2.4GHz and 5GHz wireless. Unlike a lot of other range extenders, it feels quick to use once set up. If you’re lucky enough to have MIMO equipped gear, the DAP-1860 supports MIMO (Multi-User Multiple Input Multiple Output). In non-geek-speak this means it can send data to individual MIMO compatible gear. Another nifty feature is that the DAP-1860 shows only a single network. It assigns devices to either the 2.4GHZ or 5GHZ network, depending on what it detects will work best. It’s not a feature with a bazillion scream LEDS that shouts “AMAZING!!! !” from neighbourhood rooftops, but it simplifies things a lot. The multi-million-dollar question (after all, what price should you put on your wife’s happiness?) is did it work? The answer is an emphatic ‘hell yes’! With the extender installed, my wife’s wonky Wi-Fi went from strength to strength. It hit max signal strength and her once wonky Internet connection is now reliable and quick too. Testing the connection from her office, I got an average speed of 25Mbps. This isn’t shabby considering the DAP-1860 costs just under $300. If you need a quick Wi-Fi fixer upper, the DAP-1860 may be what the doctor ordered.